Please note that the content of this book primarily consists of articles available from Wikipedia or other free sources online. 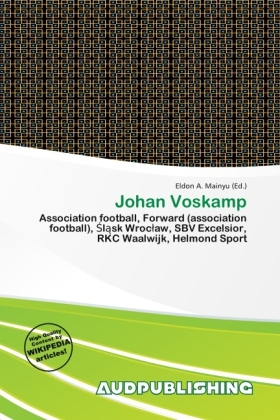 Johan Voskamp (born 15 October 1984 in De Lier, South Holland) is a Dutch footballer who plays as a striker for l sk Wroc aw in the Ekstraklasa. Voskamp has previously played for Helmond Sport, Excelsior Rotterdam and RKC Waalwijk. He signed for relegated Jupiler League side Sparta Rotterdam ahead of the 2010 11 campaign, but missed the club's first game of the season, a 2 1 win away at Go Ahead Eagles. He made his debut a week later against newly-named Almere City, scoring eight goals on his debut in a 12 1 win. He ended up the league's top goalscorer in what was a dismal season for the Rotterdammers. In July 2011, he joined l sk Wroc aw on a three-year contract. He made his debut on 14 July as a substitute against Dundee United in the Europa League second qualifying round first leg and scored the only goal of the game giving his team a 1-0 win.